Buy Darlac lightweight shears: <ul><strong><li>Light and comfortable to use</li><li>Long handles for greater reach</li><li>Shock absorbing buffers</li></strong></ul><br>Suitable for grass, hedge trimming and topiary, these lightweight shears will help you trim in comfort.<br><br>They weigh less than a kilo and are fitted with shock absorbing buffers, making them super manoeuvrable and minimising arm fatigue when cutting over long periods.<br><br>Extended handles give them a generous reach, and the razor sharp carbon steel blades can be replaced to keep your shears as sharp as the day you bought them.<br><br>Available in a choice of two sizes, sold separately.<br><br>Measurements:<br>Small - blade length 8 inches<br>Large - blade length 10 inches<br><br>Please note: it is an offence to sell knives and other cutting tools to persons under the age of 18 years. Well made , strong but light and very easy to use. 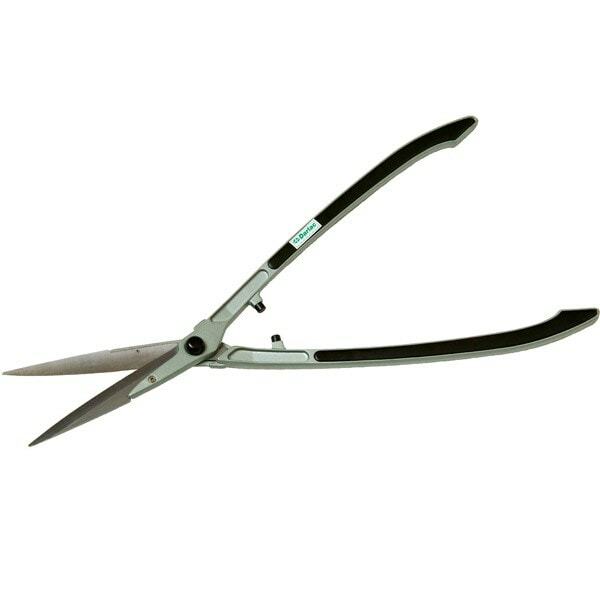 These shears are perfect for trimming bushes and hedges. Because they are so lightweight they don't make your arms ache no matter how much you have to do. They are a 'feel-good'design being perfectly balanced and having comfortable handles.